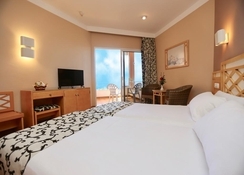 Hotel Puerto Palace is a charming 4-star hotel situated in the quiet neighbourhood of Puerto de la Cruz, in Tenerife at the feet of the impressive Orotava valley. The property serves as an excellent base to help you explore the Puerto de la Cruz resort, while making certain that you are comfortable and relaxed in its spacious rooms alongside a pleasing choice of facilities. 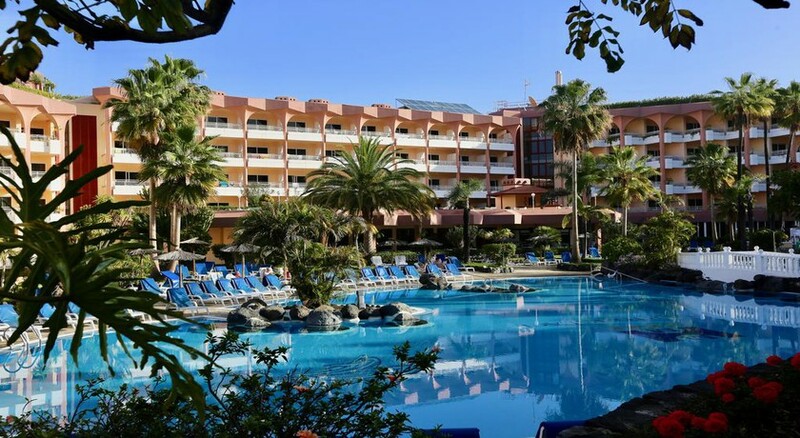 Coupled with a 24-hour reception and friendly workers to assist with all your requests, the hotel is perfect to have a relaxing holiday in Tenerife. The hotel offers a range of facilities to its guests along with a surprising garden, gymnasium, hairdressing salon, shuttle to the city centre and a lounge with TV, animation and games. Guests may relax at the impressive pools, the larger one being heated, another saltwater one with natural falls and another swimming pool meant for children. 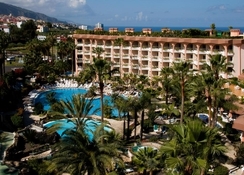 Hotel Puerto Palace is barely 1km from the Puerto de la Cruz beach. Placed strategically within the charming resort of Puerto de la Cruz, the hotel is a perfect option for a family vacation. The hotel’s neighbourhood is brimming with restaurants, retailers and leisure spots; it additionally has shuttle services to the City Centre. Distance from Puerto de la Cruz bus terminal is 1.3km; Plaza Charco is 1.7km and Tenerife North Airport is 26.5km from the hotel. The Puerto Palace Hotel offers comfy and cosy rooms at the feet of the valley Orotava, with excellent views of the ocean or the mountains. These are available in categories of single rooms, double rooms, triple rooms and junior suites – meaning there's something within reach to suit each taste and pocket. Each of the well-furnished guestrooms come complete with an en-suite bathroom, hairdryer, minibar, music, satellite TV, safe and terrace with gorgeous ocean or mountain views. There's a wake-up service for guests too. The hotel features a beautiful restaurant where delicious buffet-style breakfasts, lunches and dinners with show cookery are served. Formal dress code, no shorts allowed at dinner except in summer. The eatery serves up luxurious Canarian and international fare carefully prepared by professional chefs. Guests can even relax with a drink at the stunning pool bar or the chic atmosphere of the lobby bar. Guests may also like the magnificent pools at Puerto Palace Hotel, the main one being heated, another with a natural waterfall and an extra pool for the children. There's additionally a pool and private space for naturist sunbathing on the upside terrace. There's conjointly a bathing tub out there and a personal space for naturist sunbathing on the terrace. This charming 4-star property provides an excellent base to help you explore the area. The hotel has a gymnasium, with a special discount for guests. You'll love a game of tennis or mini golf before witnessing the evening’s live amusement and games.